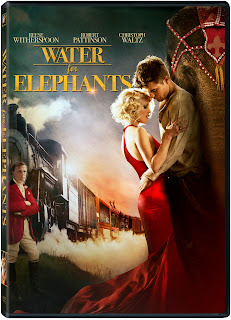 Take a journey back in time with the romantic tale based on Sara Gruen’s New York Times #1 Best-Seller novel of the same name, WATER FOR ELEPHANTS, coming to Blu-ray and DVD on November 1st from Twentieth Century Fox Home Entertainment. Starring Academy Award®-winner Reese Witherspoon (Walk The Line), Robert Pattinson (Twilight series) and Oscar®-winner Christoph Waltz (Inglourious Basterds), the film presents an epic tale of forbidden love in a magical place filled with adventure, wonder and great danger. 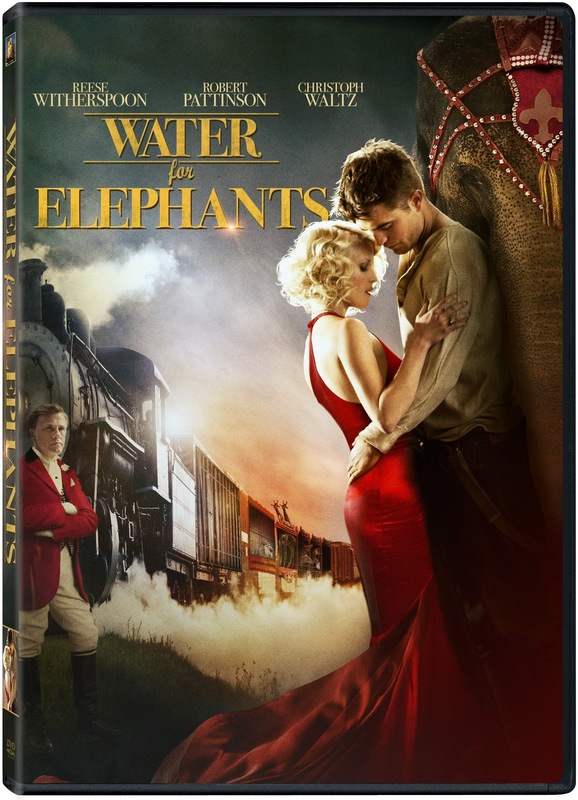 Showcasing the decadence of a bohemian circus and the majesty of its animals against the backdrop and beauty of a bygone era, WATER FOR ELEPHANTS makes the ideal holiday gift idea for your favorite film buff, fashionista or book-lover! The story is set in 1931, during the Great Depression in America. Times are hard among all different types of people. We see this in the most influential individuals, down to the grittiest working class men. While reading the book I pictured that lost look in so many faces. The same look carried over in to the film, where it was evident that Robert Pattinson's character had no idea what tomorrow would bring him. He was living for the moment, with just the shirt on his back. Jacob's character is by far my favorite. He is what carried this story so well for me. I fell in love with his innocence and will to want to do better, be better. I felt that Robert Pattinson portrayed his innocence very well. In almost every scene, we saw his reaction through his eyes to things he had been witnessing for the first time. It pulled you in and made you feel as though you, too, were seeing these things for the first time. In the book, I received Marlena's character as someone who had unknowingly found herself mixed up in the circus life. She was an innocent being, herself. Very shy and soft-spoken. Her passion for animals was obvious right from the start, and her devotion to her husband appeared to be true as well. I felt as though Reese Witherspoon took Marlena's innocence and gave her a harder edge, more daring. If there is one flaw in the movie, from the book, that I would have changed it would be Marlena's character. The reaction I felt was just off to me. I was also a bit sad to have missed the pink sequins in her performance outfit. In Jacob's first encounter with Marlena, her pink sequins is what caught his eye. I missed that element in the film. The passion between Jacob and Marlena was a slow build in the book. For movie purposes, we tend to see that relationship on fast forward. It almost appears to be insta-love, which is not always believeable. I definitely preferred the slow build in the book. Marlena's character stayed true to the time era, when a woman was to be loyal to her husband, no matter what the circumstances were. It took some time before she gave in to her feelings and reacted. Aside from Jacob's character, the circus itself was my next favorite element of the story. It encompassed so much of what that time stood for. 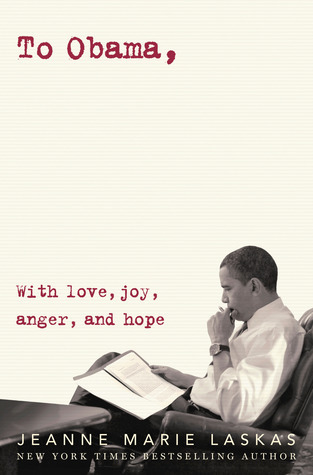 The illusion of happier times. The country was going through a devastating period, trying to recover from economic failure, yet here was a little piece of magic that would roll in to town and help people to remember how to smile again. Behind the illusion is reality though, and that is something we saw a lot of. Hard working men went hungry, constantly. Rules were broken, and people behaved in cruel ways in order to survive. Rosie, the elephant, carried over from the book to film precisely. Some of the most difficult scenes to read about, were also the most difficult to watch on screen. However, Rosie created some of the most heart-warming moments as well. Jacob's love for this elephant is what created a foothold for him in this circus life. He felt responsibility to her, and knew she deserved something better than what she was given. Marlena noticed Jacob's devotion to the animal, and it's something that sparked her interest in Jacob as well. Sara Gruen's story of Water for Elephants depicts an era when times were tough, yet a sense of hope can be shed on even the hardest of moments, too. The human being can be cruel, but the human spirit can be surprising. If you've read the book, then I encourage you to watch the film. It's a timeless story that's been brought to life, with imagery that will linger forever in your mind. Desperate to see this movie... LOOOOOVED the book so much. Thank you for the amazing opportunity to win both. I Love this book and the movie was exceptional! Thank you for the giveaway! Great Review G! i Really enjoyed the book when I got it as a gift a few years ago! I haven't seen the movie yet! I hope I like it as much as I did the book! I can't believe I did not mention Rosie!!! You are right that it was hard to read and hard to watch those scenes. Great review girl. I was wondering how the book and movie was. The movie looked great in previews I just never had a chance to watch it yet. I know books tend to be better, thanks for the chance to win :) Have a Happy Halloween! Great review! I really want to read the book now before watching the movie. I've been wanting to see the movie too. I'm glad Rob played the part well. Great review. I remember my sister wanted to see this one but kept calling it "Like Water for Elephants" a la "Like Water for Chocolate" LOL. I loved this book. It's a shame movies can't be exactly like books. I think this will be one of the books I read on vacation. :) Then watch! gonna be honest, i was not totally into the idea of this book, but you have convinced me otherwise. Jacob sounds completely swoonworthy and genuine, and i ADORE history things. being the nerd that i am, and all. thanks for the sweet contest! You just captured the essence of this book (and movie) in the most beautiful way. I fell in love with the book last year, and then the movie this year. It's one of those stories that has enraptured me and I hold it very near and dear. You've made me see the little things in a bigger way. I love this book so much! It is amazing, I've read it so many times. I just can't get enough of it. I haven't seen the movie yet, but your review gives me hope that it will be a good adaptation.